Edwards Abstract and Title Co. welcomed Dr. Ted C. Jones, Ph.D. as the guest speaker during the 14th Annual State of Real Estate Forum held on March 8, 2018. For the past fourteen years the State of Real Estate Forum is coordinated and presented by Edwards Abstract and Title Co. as a resource for real estate industry professionals. 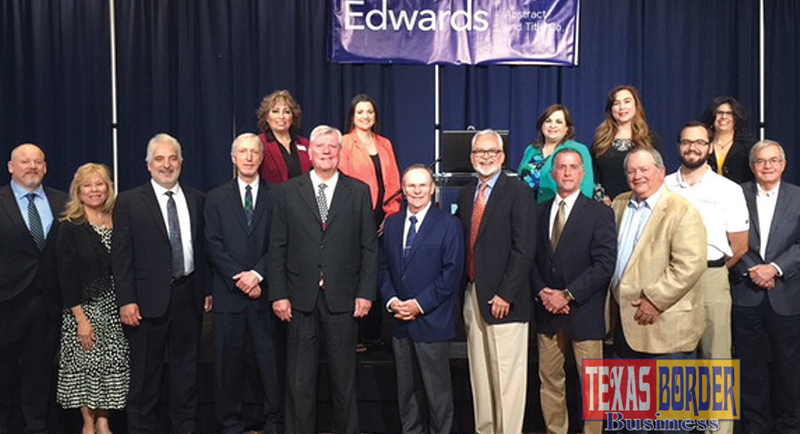 Pictured are members of the Edwards Management Team and special invited guests. (First row L-R) Brandon Linscomb, Stewart Title Guaranty Co.; Elva Jackson Garza, Edwards Abstract and Title Co.; Mark S. Pena, Lewis, Monroe & Pena, LLC; Alan Monroe, Lewis, Monroe & Pena, LLC; Dr. Ted C. Jones, Sr. Vice President & Chief Economist with Stewart Title Guaranty Co.; Mayor Jim Darling, city of McAllen; Byron Jay Lewis, Edwards Abstract and Title Co.; N. Michael Overly, Edwards Abstract and Title Co.; D.D. Hoffman, Edwards Abstract and Title Co.; Chris Hughston, Edwards Abstract and Title Co.; and William Rountree, Law Office of William Rountree. Back row: Pamela Dougherty, Edwards Abstract and Title Co.; Mariana R. Ramirez, Edwards Abstract and Title Co.; Marilyn De Luna, Edwards Abstract and Title Co.; Letty Rodriguez, Edwards Abstract and Title Co.; and Diana S. Kaufold, Edwards Abstract and Title Co.
Edwards Abstract and Title Co. hosted the 14th Annual State of Real Estate Forum on March 8th at the Edinburg Conference Center and it did not disappoint. A record attendance by realtors, lenders, builders, developers, real estate attorneys, business and civic leaders, helped fill the conference room. Edwards Abstract and Title Co. has made a commitment to provide resources that the company has available to share in the RGV market and the Real Estate Forum continues to be the company’s premier event. Dr. Ted C. Jones, Senior Vice President-Chief Economist for Stewart Title Guaranty Company and Director of Investor Relations for Stewart Information Services Corporation (NYSE-STC)was the keynote speaker as he has been for the past thirteen years. Dr. Jones’ presentation titled By the Numbers – 2018 Real Estate and Economic Outlook, provided insight and statistics on the national, state and local job markets and specifically the local real estate market. He shared analysis and various other indicators that positively affect the Valley’s economy. President and C.E.O. of Edwards Abstract and Title Co., Byron Jay Lewis, welcomed guests and served as the master of ceremonies. “Every year I am humbled and energized with the support and attendance at our annual State of Real Estate Forum,” said Lewis. “Ted has a way of condensing and presenting complex economic data in an entertaining and easy to understand manner. 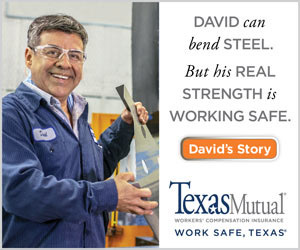 The Rio Grande Valley of Texas continues to be a wonderful place to do business, and has an even brighter future,” he added. Dr. Jones’ presentation related the job growth rates in the nation ending December 2017 showed that Texas ranked 4thin jobs created at 2.53%. Nevada led the country at 3.31% followed by Oregon, Utah, and Florida is 5thwith a slightly lower margin than Texas at 2.51%. Dr. Jones posted on his blog recently that jobs are the number one driver of the economy. “Jobs are everything to an economy. 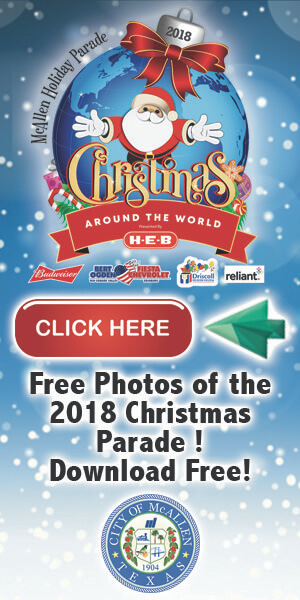 Period.” He went on to say,“So goes the number of jobs, so goes (in general) the demand for housing, commercial real estate and the overall performance of the economy.” In the McAllen-Edinburg-Mission MSA jobs increased 1.45% creating 3,700 net new jobs ending December 2017. Juan Olaguibel, Director of Bridge Operations for the McAllen/Hidalgo and Anzalduas International Bridges was the guest speaker. Mr. Olaguibel’s presentation on the City of McAllen International Bridges provided insight on the volume of vehicle and commercial traffic and their focus on doing what they can to make the use of these bridges as positive an experience as possible. He also highlighted the advertising that is in place to attract and inform more international travelers regarding the quickest access available for crossing at the Anzalduas or McAllen-Hidalgo International Bridge. “It was my pleasure to participate in such a valuable program. The economy in the RGV is diverse and enigmatic and Edwards Abstract and Title Co.’s Real Estate Forum allows speakers to share valuable information and insight,” said Juan Olabuibel. Edwards Abstract and Title Co. specializes in Mobile Closing Services for customers in Hidalgo and Cameron counties. The Edwards Escrow Teams will coordinate and assist in finalizing closing documents at a location that is convenient to the customer. The title insurance company operates full-service offices in Hidalgo and Cameron Counties in the cities of Brownsville, Edinburg, Harlingen, McAllen, and South Padre Island. For more information regarding Edwards Abstract and Title Co.’s experienced personnel, products and resources, visit their website or log on to Facebook, LinkedIn or Twitter.